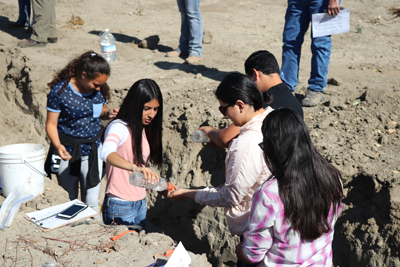 Land-judging contests introduce high school students to basic soil science with a hands-on land assessment protocol using soil pits in which students note soil horizons, texture, slope, color and other characteristics in a competitive, educational setting. Land-judging competitions are held nationwide with opportunities for regional, state and national Future Farmers of America-sponsored competitions for motivated students and instructors. In Monterey County, RCDMC hosts land-judging contests dependent upon the level of local instructors’ interest. In 2018, the contest will be held in coordination with the FARMS Leadership Program for selected Monterey and Santa Cruz County students. The land-judging training materials and methods are maintained at the California Polytechnical University in San Luis Obispo.